Oleksandr focuses his practice on Dispute Resolution (both litigation & arbitration) and Human Rights Protection matters. He is also active in Corporate and Commercial matters as well as involved in Banking and Finance projects. Advised Makita Ukraine – a global producer of electrically operated tools – in a labor dispute with former employee. 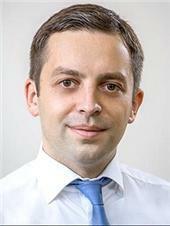 Represented interests of a major Ukrainian car dealer in a UAH 375,000,000 multi-jurisdictional dispute in Ukraine and Cyprus with Alfa-Bank (Ukraine). Represented a Ukrainian agricultural holding in a UAH 500,000,000 dispute with PUMB, one of the largest Ukrainian banks (Ukraine). Advised a major Ukrainian bank in a UAH 137,000,000 dispute with tax authorities. Advised Adyax IT Company on certain corporate, labour and tax matters. Represented a Swiss investor in a dispute regarding the title to real estate versus the real estate’s former owner. Advised a real estate developer regarding land plots’ related matters, including legal due diligence for the lands’ acquisition purposes. Represented a foreign investor in a dispute with real estate developer concerning property title to the premises located in Crimea. Represented a Ukrainian supplier of farming products in an over UAH 3,000,000 dispute with an agricultural company regarding its payment obligations. Represented private individuals in a dispute with the major Ukrainian Bank regarding early debt collection for a total amount of over USD 1,000,000. Represented a head of the representative office of a large German pharmaceutical company in a labour dispute regarding an alleged wrongful dismissal. Advised a Ukrainian developer regarding drafting of mortgage agreements to be concluded with a large foreign bank. Advised a foreign investor in Ukraine on a complex corporate and real estate related dispute . Advised a major Ukrainian bank and several individuals regarding application to the European Court of Human Rights. Represented a Ukrainian cargo company in a dispute with a lessee of the company’s premises. Advised a foreign investor on letting policy and structuring of leases for large office centres, retail malls, logistic parks and the kind, advised on different-type property management transactions. Advised a foreign investor on different legislative and regulatory requirements for launching industrial facilities in Ukraine, including on commissioning of such facilities and securing licenses and operational permits.